Swedish lightheavy Erik Skoglund (22-0) have switched trainers from Karsten Rover to Tommy Antman. It was previously announced that Skoglund would train for his fights at home in Nykoeping but would remain in the team of Rover. Antman is a veteran who trained two-time EBU heavyweight champ Anders Eklund in his amateur days and also some of the best amateurs in Sweden such as Leo Vainonen. Skoglund is in full training for the show Sauerland Promotions bill as Making History September 19 in Nykoeping where he defends the IBF I/C title against Oleksandr Cherviak (15-4-1) for what will be the first international title fight in Sweden since 1968 over what today is title distance: 12x3. 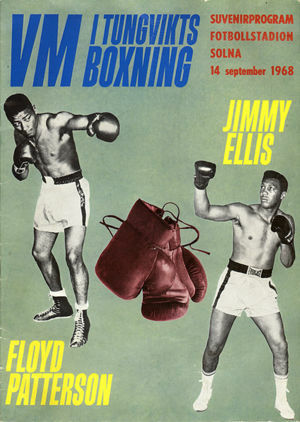 Jimmy Ellis-Floyd Patterson in 68 was over fifteen rounds but since professional boxing returned in 2007 we’ve had title fights over 6x2 and 10x2 (featuring male fighters that is). EBU welter champ Gianluca Branco (49-3-1) now have Leonard Bundu (32-1-2) as official challenger in what will be an all Italian battle between two 40+ veterans but first Branco will make a voluntary defence of the title in September against an opponent to be announced. Branco had no other than Paul Malignaggi in what would have been a mandatory defence but after Malignaggi lost this past weekend he is out of the picture. Romain Jacob (23-0) defends the EBU superfeather title Nov 10 in Boulougne sur Mer (France) against Spaniard Juli Giner (17-1-1). Jacob is in the top three with both the WBC, WBA and IBF so he will most likely go for a World title in 2016. As for Giner he held the EU title but will now be stripped of that as he will fight for the EBU Crown. Igor Michalkin (16-1) defends the EBU lightheavy title October 9 in Clermont Ferrand (France) against Hugo Kasperski (26--5-1). It´s a voluntary defence by the champ, who won the title in France by knocking out Hakim Chioui. Kasperski is reigning national champ at 175. Michalkin vs Kasperski is promoted by Pierre Robin. Michele Di Rocco (40-1-1) has relinquished the EBU superwelter title to concentrate on a shot at a World title. Di Rocco is # 3 IBF, # 4 WBA and # 10 WBC and not ranked by the WBO. Official challenger Lenny Daws (30-3-2) will now fight the highest available contender for the vacant title. 117-110, 116-111 and 115-111, vacant WBC Silver lightweight title. 40-36 twice for Marsili and 39-38 after four for Diaz, 78-72 twice, 77-74 for Marsili. these fights were set for the cancelled Encarnacion vs Takoucht show in Madrid. Big upset and it looked as McCullough had no punch resistance at all. Floored, hurt and finally retired by his cornemen.